Place a prominent GIVE HERE button on the home page of your website. Turns out even some of the ivy league schools both Fab SIL and Big Bro attended force their alumni to dig around. Big Bro gave up poking around one favorite nonprofit’s site and actually Googled “give to [this organization]” before he was led to a link. Research by Dr. Bill Crowe, Senior Public Service Faculty and Director at University of Georgia and former President at Tyler Community College, TX, indicated that ONLY 5.9% of community college websites have a Call to Action (Donate/Give Here) button on the home page of their college’s website. Yikes. Set up a secure ONLINE GIVING option. Many of you already know that the crew at Binns Drennon LLC make ubiquitous use of Compression Planning®, a marvelous tool for planning everything from a case for support to a grant. Yes, it’s a magic bullet when planning the big stuff (strategic direction, campaigns, DACUMs). Often, we break the process into pieces to create short, quick sessions that resolve smaller and more immediate challenges. One of our favorite “15 Minute CP” sessions is donor prospecting at foundation board meetings. It’s a fabulous way to engage your board members in meaningful discussions, and helps those who are reluctant to “ask” for support contribute to the foundation’s overall development plan. You can use this process to prepare potential donors for a capital or major gifts campaign. Or, to introduce new or emerging businesses and other newcomers in the community to your institution, programs and services. Or, incorporate the process in your “planned giving” planning. Or, or, or… you’ll find a dozen ways to incorporate this process in all of your fundraising. The 15 Minute CP Prospecting Session works if you’ve already created your development plan, which includes a cultivation plan. Ideally, your cultivation plan includes opportunities throughout the year that showcases faculty lectures and/or labs, student success and achievements, and specialty labs or classrooms, as well as cultural and athletic activities that reflect the goals in your development plan. Don’t forget to look deeply into your college’s non-credit/workforce development offerings for opportunities to showcase college expertise and innovation. Then prepare a calendar of cultivation opportunities that you can distribute at your next foundation board meeting. We have found that doing this exercise right at the beginning of your foundation board meeting creates all kinds of energy, setting a positive tone for the rest of the meeting. Remember, keep the session simple to keep it short. Only work on 2 or 3 cultivation opportunities at each meeting. Title a board or flip chart with each of the cultivation opportunities you identified in your calendar. This process should happen quickly. You don’t have to set dates or make the schedule there (unless the cultivation event is already a set date). You might have 0-4 donors for each of your cultivation events. It’s ok if you don’t have any takers for a specific cultivation event. All the planning for the on-campus visits take place later. This is just a quick way to link board members to donors that lead to cultivation opportunities. Planning a visit obviously takes some time. Ideally, you’ve arranged everything so that your board member can simply offer the invitation and accompany the donor. Where you have a set cultivation activity and the date is not flexible, it’s great to turn it into a “mini special event” with no more than 6 prospective donors and 2 or 3 board members. These intimate cultivation events are where your board members can really get “on board.” Don’t make “an ask” on the tour. Let your prospect become fully engaged and let your board member be the “host.” If you can, walk your donor across campus during a busy time when classes let out, or through the student union or library. Afterwards both you and your board member should write notes thanking the prospective donor for taking time to come to campus and to ask if they have any questions. Further follow-up should continue to reflect your foundation’s development plan. Over time, your board members become mini-experts on particular programs or services that they introduce to prospective donors. And that pays off in the community as they “talk up” the college and programs naturally in conversations. After a while, as success builds and funding starts impacting programs and services, faculty and program directors actually begin to come to you with ideas for engaging prospective donors. Sometimes it seems like there is nothing new under the sun. Over 2300 years ago, the great Greek philosopher, Aristotle, proposed that a persuasive – or rhetorical – appeal contained three elements: logos, pathos, and ethos. These ideas still prevail, and if you analyze any great story or compelling essay, or unforgettable advertisement, you’ll find these same elements. Everyone knows that in fundraising and grant development, you need a good story. So when you develop you Case for Support or you Need Statement, be sure that you use logos, pathos and ethos to make your case. What keeps logos from being dull and pathos from becoming treacly? Ethos – your credibility. These statements will establish why your college is THE community organization that can solve the stated problem. Longevity, past successes, quality of faculty, speed of programmatic development and delivery – these are all ways that express your credibility. Another way of thinking about ethos: what right do you have to claim you can solve the stated problem? Most of the time (and most effectively), your credibility is woven into your logos and pathos, not necessarily a separate statement. However you establish your ethos, though, be sure it’s present in your Need Statement or Case for Support (check out Bucks County Community College’s Case for Support. Click on the links to the PDFs). Without it, you are unconnected to the data (logos) and/or manipulative (pathos). Your mission is critical – not just to your community as a whole, but to each individual you touch. You are worthy of philanthropic support. Move YOUR mountain. What happens once you’ve decided to pursue a grant opportunity? You get everyone who could be involved in developing the idea, but how do you engage them in developing a concrete and sequential action plan, and “owning” the task list that results from the discussion? Vicki Jeppesen, Director of Resource Development and Institutional Research at Northcentral Technical College, WI, reported exemplary results when she used the tool to plan TAACCCT Round 3. “We used Compression Planning® with all our external partners (see box), to share what each individual agency was doing: their mission, projects, and so on,” she noted. “It quickly became evident that all of us were investing resources in career pathways, but doing so in silos, and sometimes at cross purposes.” Additionally, she was thrilled that collaboration among these “competitors” was so easily facilitated by the Compression Planning® process. All the agencies voices were heard, no one dominated the conversation, and the agenda was clear to everyone throughout. Karla Hibbert-Jones, Director of the Grants Development Office at Sinclair Community College, noted that they have been using Compression Planning® for over 25 years to develop grant proposals. In fact, she feels that the process gives their shop a competitive edge. CP’s highly structured process allows groups to achieve their purpose, avoiding the meandering that occurs during most meetings. It further increases productivity because the outcome of the session becomes the outline for the proposal. “You never have writers block when you use CP,” she commented. And like Jeppesen, Hibbert-Jones extols the process when working collaboratively with multiple partners. 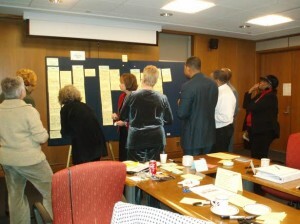 The collaborative sharing of ideas, supported by the CP process, allows the planning team to identify unique factors to incorporate into a proposal that will make it stand out from others. With CP, you can collaboratively generate ideas that would not easily be generated by someone working in isolation. Recently, Sinclair Community College has partnered with the McNellis Company to train other institutions involved in joint grant development opportunities through Sinclair’s North American Compression Planning® Center. Over the last five years, Sinclair’s Workforce Development Division has partnered with McNellis Company to offer Compression Planning® Institutes and custom planning engagements. Through the Division, McNellis and Sinclair have brought together employer groups (including Advanced Manufacturing, Health Care, and Call Center) to identify, develop and launch appropriate new training programs via the Compression Planning® process. In addition the partners have facilitated the regional Compression Planning® engagement on entrepreneurism for the Dayton Development Coalition. Sinclair hopes their new initiative will benefit organizations who seek to solve intractable organizational problems, build strong and efficient organizations, and manage complex projects. I’ve been reading a lot lately about conversion rates, optimizing copy, branding, conversion copy, auto responder marketing and a multitude of other marketing concepts. I have to say, I’m fascinated by the relationship of fundraising to marketing, particularly how to convey with clarity that the work we do deserves philanthropic support. For a fun look at some pretty bad non-profit marketing pieces, see Stupid Nonprofit Ads from Future Fundraising Now. Jeff Brooks, the creative at TrueSense Marketing, dissects each of these ads, pithily pointing out fuzzy and/or esoteric language, misplaced visual metaphors, and sloppy donor analysis. Fortunately, he also suggests fabulous ways to clearly connect with the intended audience. The MGs (Marketing Gurus) that KNOW their stuff, talk a lot about understanding the customer, feeling their “pain points”, and focusing marketing copy on how the product will deliver the customer from that pain. In other words, marketing is all about the customer and his/her needs and not about the product. So let’s substitute “motivation” for “pain” when speaking with our donors, and find ways to satisfy a donor’s motivation to do good in the world. Many companies create avatars to represent individual customers in order to speak more directly to them. It’s a practice that would be very useful in developing fundraising case statements and proposals that would speak to a donor’s deeply held motivation. What led me to Beyond Everything Simply Terrific Community College (BEST CC)? What was the best part about being at BEST CC? What was the worst? What did I do besides go to class at BEST CC? Did I avail myself of academic services at BEST CC? Student engagement activities? What was going on in my life outside of my academic world at BEST CC? How did I juggle my two lives (personal/academic)? What did BEST CC do to help or hinder that juggling? What kinds of relationships did I develop with my professors? Are they maintained? If not, why not? What’s going on in my life now? Work? Family? Recreation? Further education? Retirement? Does anyone at BEST CC care about what I’m doing right now? If so, what do I think about that? If not, what do I think about THAT? When you’ve answered those questions, can you discern the motivation for your donor to give to a program, service, scholarship, lab, or academic center? In the end, of course, you may not writing a case for support or a proposal to just one donor (actually, you MAY be). But when you really dive into your donors’ motivations, you can speak directly to their deepest feelings and beliefs of how they manifest their humanity through philanthropy.